Services are customizable to fit our client’s needs. Nothing is off the shelf. The interactive patient education provided to our clients does not get there by accident. For patient education to be effective it must be read and understood by the patient. Studies show that often time, patients do not read the handouts given to them, and when videos are available, patients get distracted or fall asleep while watching them. Verbal instructions can be effective but are time consuming and rendered ineffective because staff and patients do not often ask questions. However, the most serious problem in delivering effective patient education is the inability of patients to understand the materials. In a 2006 study, it was estimated that 75 million adults in the United States (a quarter of the population) could not read well enough to understand basic health information presented in simple documents. Functional literacy5 is a symptom of failure of our educational system, which has trickled down to healthcare. It also affects all aspects of life; from work productivity to informed financial decision making. Low levels of health literacy are associated with poor health outcomes, including increased rates of hospitalization and increased mortality. It is estimated that the cost of low health literacy for the United States economy is up to $238 billion each year6. Since its inception, the Patient Education Institute has been driven to overcome the main obstacle in preventing healthcare institutions from reaping the benefits of patient education. If you are a healthcare provider, you are well aware of the criticality of patient education and getting patients active in their health care. The benefits of patient education are well documented: Patients have better outcomes when they recognize their complications sooner, and when they understand the instructions given to them. This, in turn, results in increased patient satisfaction and reduced re-admissions. Patient education is essential to shared decision making. When patients are involved in making healthcare decisions based on unbiased information, they often do not request a second opinion or cancel surgical and imaging appointments. This improves efficiencies in health system processes. 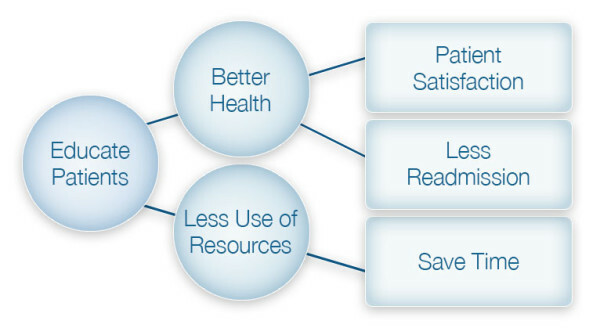 All benefits of patient education can be connected to cost savings: time savings and reduced clinical visits and re-admissions are associated with a lower cost to payers.